It may seem like something that may never happen at your home but when your roof starts to leak it could start causing all sorts of problems. Because most home owners usually don’t take any actions when it comes to their roofs until a roof starts leaking it could cause your home to have other damages including water damage when your home’s roof fails. For home owners in Brighton Michigan getting roof repair is easy. 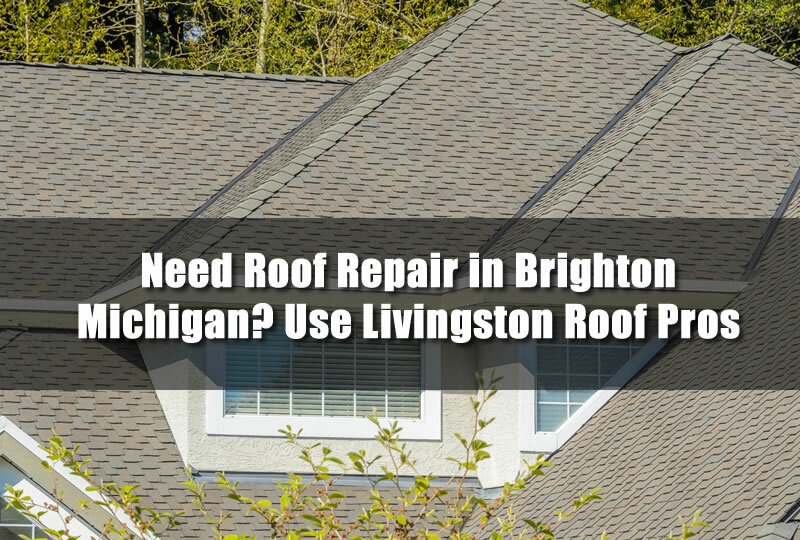 Simply call Livingston Roof Pros to repair your roof in Brighton Michigan. As one of the top roofing contractors in Brighton Michigan, we can repair your roof quickly so you don’t experience more damage from your roof leaks. Hiring a roofing contractor in Brighton Michigan can be filled with choices. Since there are many roofing companies and roofers in the Brighton Michigan area there are many choices for home owners. While having competition is not something we are opposed to here at Livingston Roof Pros, we do want to share with you why we think we are the best roofing contractor in Brighton Michigan. There are lots of lower quality roofers who may offer services to you possibly even at a lower price but be careful when using cut rate roofing companies in Brighton Michigan. You may need a roof repair or roof replacement again in a few years if it’s not done properly. At Livingston Roof Pros we want you to have the best roofing available. That’s why we always use high quality products to cover your home or to do roof repair in Brighton Michigan. Most roofing systems that we install also come with a full warranty that can last for decades to come. Make sure when your home’s roof is repaired or replaced that only quality products are used to do so. At Livingston Roof Pros we always use the high quality products on your home’s roof. One of the biggest complaints and problems of most roofers is they are not reliable. They miss appointments, allow projects to go on for days or even weeks, and simply are not trustworthy. At Livingston Roof Pros we’re always ready to answer questions, make inspections, and more. We are reliable and keep appointments. We also outline the time frame needed for any of the work that we provide. From roof repair in Brighton Michigan to full roof replacement in Brighton Michigan we’ll give you details of how long it take and just what it will cost with our estimate. Don’t cut corners on your home’s roof. Instead use a quality roofer in Brighton Michigan that can deliver professional results and craftsmanship to your home in Brighton Michigan. We use roofing technicians on staff that have decades of experience using all types of roofing systems. We offer quality work and always stand behind any work we do at Livingston Roof Pros. One of the biggest problems for most roofers in Brighton Michigan is they are not fully qualified and licensed for roof repair in Brighton Michigan. Don’t fall for a scam that can leave your roof in worse shape than it’s in now, use quality roofing contractor in Brighton Michigan such as Livingston Roof Pros. We offer quality work and always stand behind any work we do at Livingston Roof Pros. One of the biggest problems for most roofers in Brighton Michigan is they are not fully qualified and licensed for roof repair in Brighton Michigan. Don’t fall for a scam that can leave your roof in worse shape than it’s in now, use quality roofing contractor in Brighton Michigan such as Livingston Roof Pros. Want to know how much that roof repair in Brighton Michigan is going to cost or do you need a full roof replacement in Brighton Michigan? At Livingston Roof Pros we offer free estimates so you’ll know the details and cost of the project before we begin. Don’t get taken advantage of by other roofers, use Livingston Roof Pros for all your roof repair in Brighton Michigan needs.